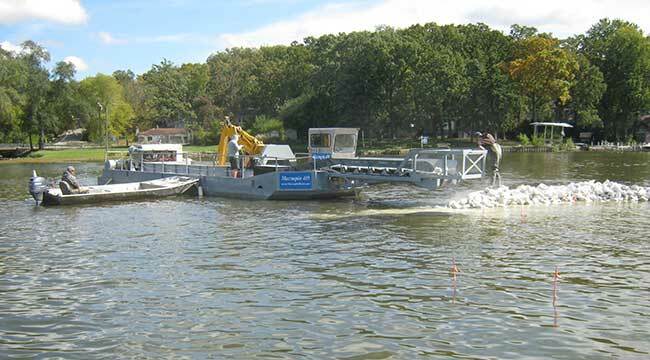 In Fall 2012, the Wonder Lake Master Property Owners Association (MPOA) completed an important element of our overall lake restoration project. 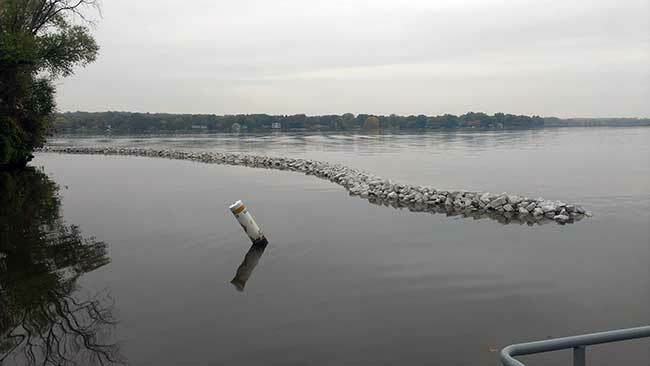 This work included the placement of supplemental limestone rip-rap on the upstream face of the Wonder Lake dam embankment, and the installation of rip-rap “collars” around three island areas in the southeast quadrant of the lake. 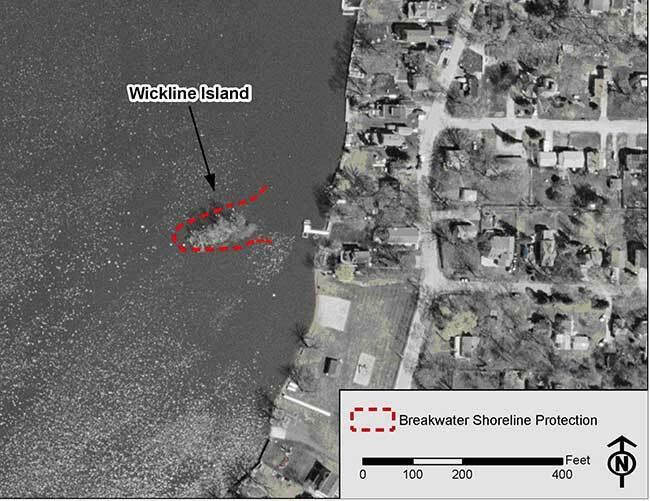 The intent of these projects is to reduce shoreline erosion by preventing waves from washing up onto shoreline soils. 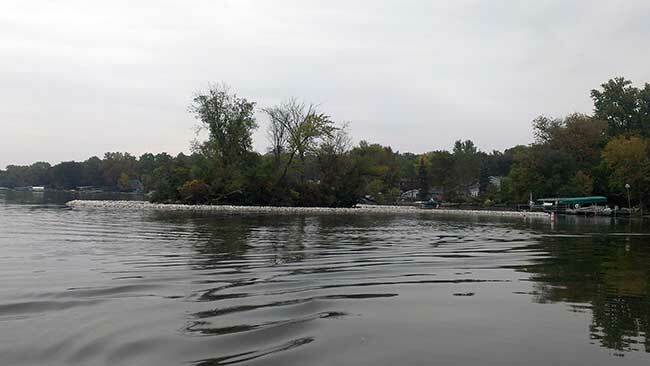 Because of the water quality benefits provided by this type of practice, the MPOA received a $67,000 grant from the Illinois EPA. 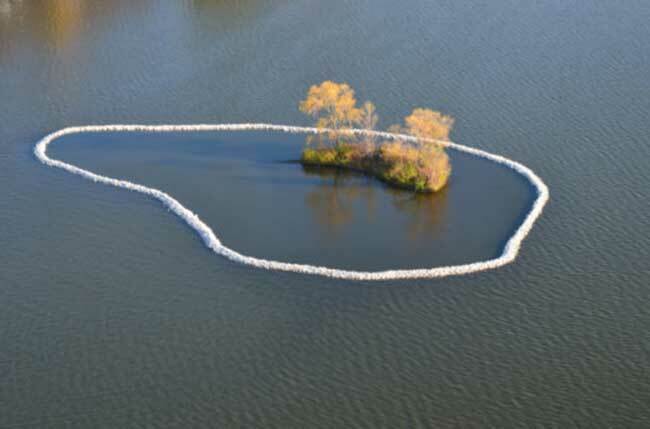 The island “collars” consist of limestone rip-rap placed on the lakebed by specially designed barge, as shown above. 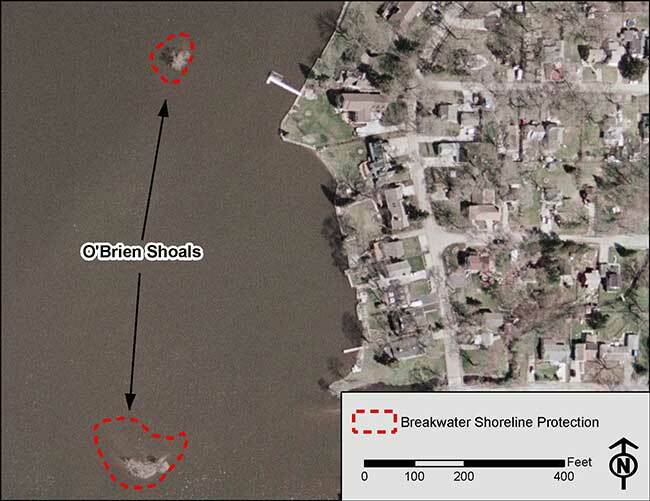 The rip-rap was installed at the two (2) foot water depth, fully encircling O’Brien Shoals North and South, and encircling most of Wickline Island, as shown below. 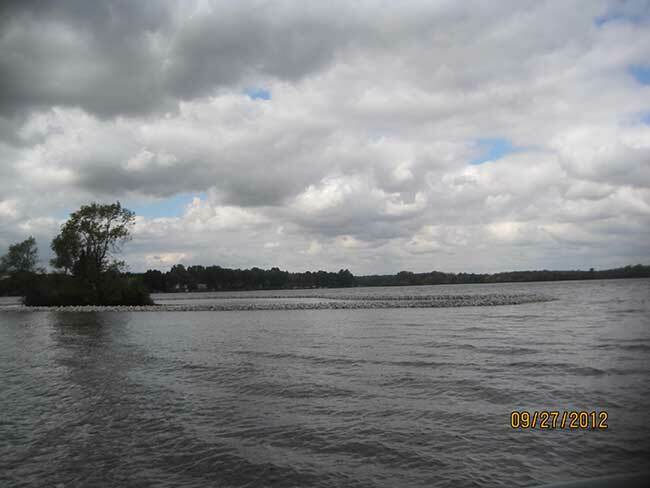 At normal water level (normal pool), the top of the rip-rap collar will protrude approximately fifteen (15) inches above the lake surface, as shown below. Any increase in water level, ice cover, as well as any snow cover, may make the top of the “collar” less apparent to lake users. 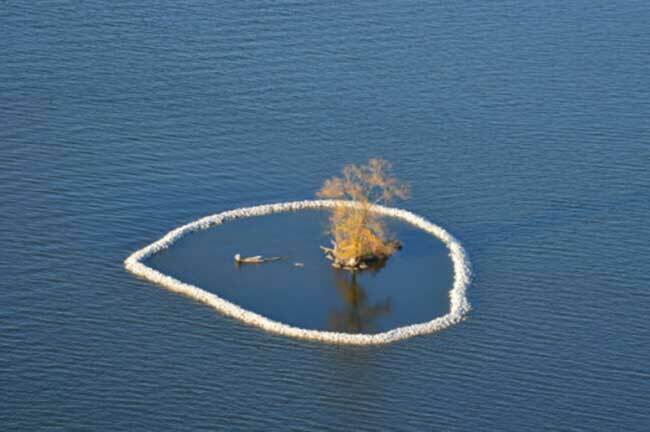 To minimize any visibility issues, the MPOA has installed orange reflective marker poles and/or orange warning flags, protruding 3 to 4 feet above the lake level, along the interior of the collar at each island, and around the entire boundary of the rip-rap collar, at roughly twenty five (25) foot intervals. 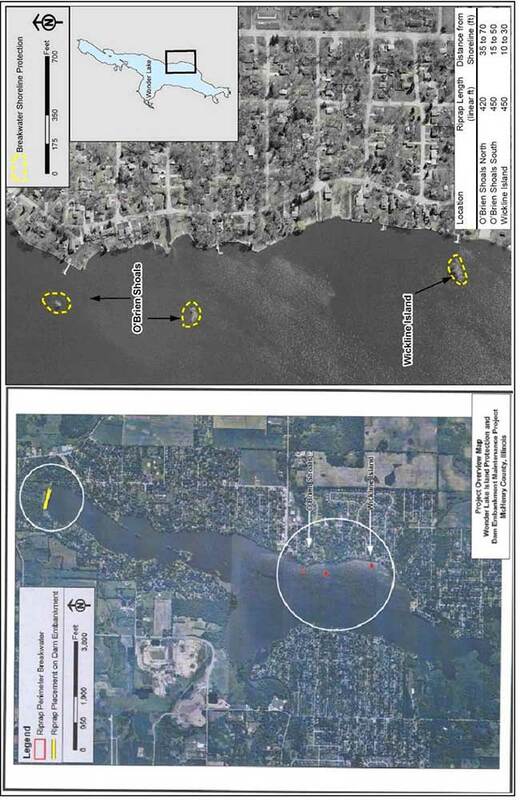 Because of this new condition on the lake, the MPOA urges all lake users to use extra caution when operating any snowmobile, ATV, or watercraft in the vicinity of the island projects. 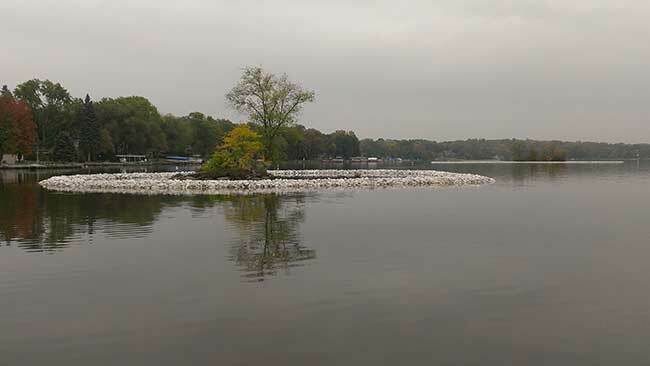 As always, lake users are encouraged to consider safety first, and to make appropriate choices as to the speed and manner of operation of any motorized vehicle. 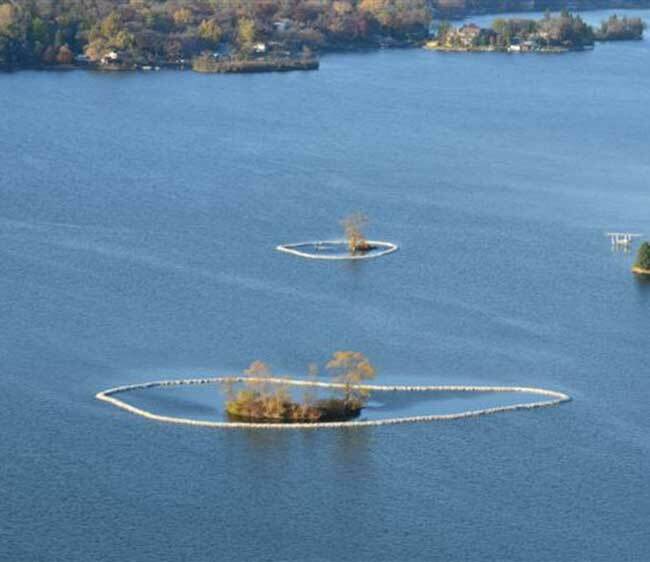 Lake users are also directed to not intentionally “jump” these structures, as those actions could move the rip-rap out of its intended position.